Today is the feast of St. Prokopius the Confessor. 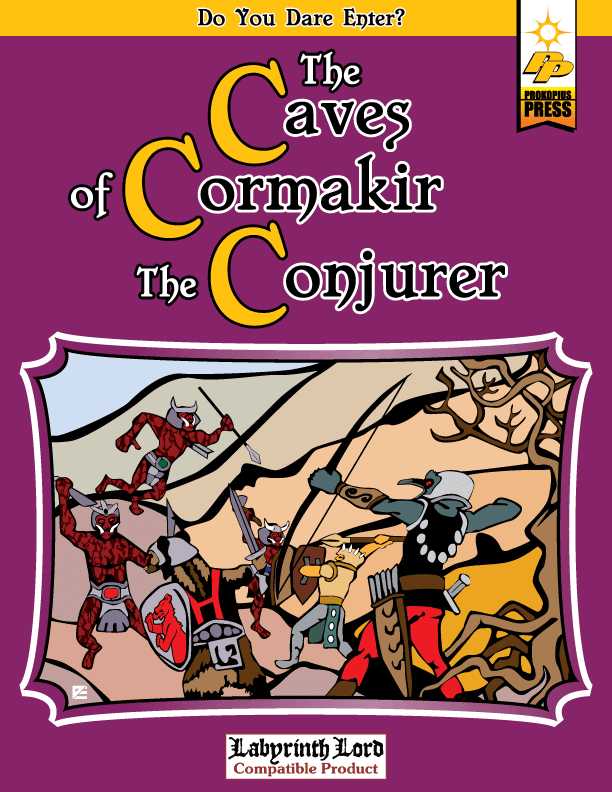 Though he is not the Prokopius for which this blog is named (that would be St. Prokopius the Great Martyr), it seems apropos to celebrate by sharing The Caves of Cormakir the Conjurer. As it was with The Slave Pits of Abhoth, I have spell checked and proof read this module myself, but have no real means to go further than that. Therefore, there will be mistakes; however, I am very pleased with the adventure and am also pleased by how quickly I was able to get it to this stage. Doing all the ground work in terms of design concept and layout with The Slave Pits have really paid off. Please consider this an open thread for constructive criticism and notes about any of the aforementioned mistakes. The file can be found here. After an initial flurry of folks making 3x5 geomorphs, there has been a dearth of creativity (though it does look like Gordon of Applied Phantasticality is going to make them a weekly feature!). Finally, how could I not be inspired to, at least, produce one geomorph based upon one of these randomized landmarks? Since yesterday, my brain has been chewing on some of the ideas that I came up with on the subject of anti-clerics, arcane cleric spells and cleric spell books. Since my ideas found fertile soul in a Holmsian-inspired vision of D&D, I figured the best place to implement them was in my standard Holmsian-esque campaign world: Averoigne. I also figured that since Holmes was influenced by Tolkien, so should I. White Magic-Users: So-called because they practice white magic — arcane cleric spells. They must be Lawful* and they cannot cast any spells above 3rd level. Black Magic-Users: So-called because they practice black magic — arcane magic-user spells. They are usually Chaotic and exist outside of the guild-structure and society itself. As a result, they are considered dangerous criminals to be hunted down and (usually) killed. 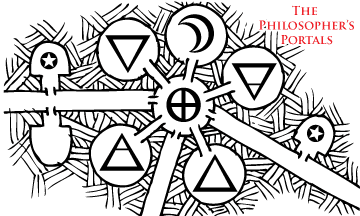 Grey Magic-Users: So-called because they practice black magic in context of the Church — a mixture of black and white. They can be Lawful or Neutral and must belong to the Wizard’s Guild. Brown Magic-Users: So-called because they are seen as close to the earth — operating mostly in villages, towns or as hermits. They use arcane cleric spells and have no formal guild. Since they practice white magic, they are generally left alone (which opens the possibility that individual brown magic-users may have a spell or two from the druid spell list). They tend to be neutral and can gain a maximum of 6th level in experience. Red Magic-Users: So-called because the casting of reverse cleric spells normally involves some kind of blood sacrifice. These are anti-clerics. They are Chaotic and exist outside of the guild-structure and society itself. As a result, they are considered dangerous criminals to be hunted down and (usually) killed. *Assuming one is using the three-tier alignment system. The Prime Requisite in all cases is Intelligence which also determines the chance of knowing a particular spell as well as the minimum and maximum number of spells known per spell level (as per Holmes). Practitioners of white magic use the cleric spell progression and XP table and may use armor, shields and blunt weapons but cannot Turn Undead. If they are Lawful and have a Wisdom of at least 9 they can choose to become full-fledged clerics at any time after 3rd level (they gain access to all spells through faith instead of study and can Turn undead). There is also a third type of arcane magic — sword magic. It interferes with both white and black magic. The latter is the most susceptible and therefore practitioners cannot wear any armor and can only use simple weapons. White magic is less susceptible, but practitioners cannot use bladed or piercing weapons. Technically, this means that clerics could use any type of weapon they choose (since they cast divine magic, not arcane magic); however, by tradition they limit themselves to blunt weapons to prevent any use of sword magic lest they misplace their faith in God with a faith in sword magic. Thus, any cleric that uses a magic sword cannot cast any spells, because they lack the faith to do so (or believe that they are called to use sword magic instead of divine magic). This opens up the possibility of a paladin-like cleric who can Turn undead, use magic swords (like a holy avenger) but can’t cast spells. I don’t know how attractive any of these options are to players, but they open up a tremendous amount of opportunities for cool NPCs, cool villains and cool patrons for yours truly. Today is the feast of St. Polycarp the Hieromartyr, and I am actually struggling to write a summary of his life and martyrdom, because there is so much we know about him and, being one of my favorite saints, I find it difficult to focus on any one aspect of his life. Eighty-six years I have served Christ, and He never did me any wrong. How can I blaspheme my King who saved me? O good God, for what times have You reserved me, that I should endure these things? We know from both Sts. Ireneaus and Jerome that Polycarp knew St. John the Evangelist and Jerome claims that it was John who made Polycarp bishop of Smyrna. As a Christian, one of the things that I struggle with is the idea of the anti-cleric, which is explicitly part of the LBBs and the heritage of D&D. On its face, the class seems to suggest a dualistic cosmology where the power of the devil is on par with God, which Christ’s death and resurrection reveal to be a total fallacy. For me, the easiest answer is to dress up magic-users as anti-clerics. This clearly delineates the fact that cleric magic comes from God and anti-cleric magic is arcane and not divine. The Holmes Basic Edition (which I find to be the edition of D&D that most strongly suggests a Christian world view), indicates that cleric spells were once arcane spells by the fact that magic users can use scrolls with divine spells on them (and one could interpret the rules to mean that only magic-users could use these scrolls). Add to that the fact that anti-clerics make awesome adversaries (see the Acolyte in Moldvay’s Basic Edition and Lareth the Beautiful from T1: The Village of Hommlet) and I have a conundrum on my hands. I mention all of this because the two verses above from Polycarp’s Letter to the Philippians seem to suggest the path toward becoming an anti-cleric as it is suggested by the LBBs where clerics must become Lawful or Chaotic by 7th level. He clearly declares that anyone who does not accept the Incarnation is an antichrist. Couple this with his mention of the presbyter (aka priest) Valens and his falling away from the church indicates (in an LBB-inspired fantasy setting) that he declared for Chaos and became an anti-cleric. So, how do I make this work mechanically while avoiding the theological net of dualism? One of the more interesting (and controversial) choices made by the good folks who put together Delving Deeper is that clerics use spell books. I believe this choice is actually inspired by Holmes and the aforementioned cleric scrolls. It seems to suggest that their are actually two paths for arcane spell-casters — a secular/pagan/apprentice-level cleric and the traditional magic-user. Both have their own spell books and practices but are close enough that, though unable to cast them from memory, a magic-user can cast cleric spells from scrolls. In the LBBs this would be the Neutral cleric. 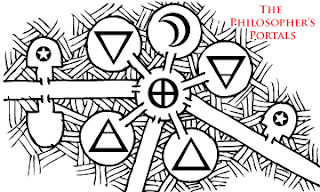 By the time one gets around to 7th level, however, it is impossible to understand these spells as anything other than an attempt by humanity to be like God sans God. Interestingly, 7th level is when LBB clerics have access to 5th level spells, including Raise Dead. Thus, one either must acknowledge the true source of these spells (God) and abandon the spell book to cast spells by faith alone or to embrace the path of the anti-cleric. Valens, then, could be understood as a Neutral cleric when he was first ordained. He did not understand what it meant to be a Lawful cleric (casting spells by faith instead of by spell book) and when push came to shove he chose Chaos and the path of an anti-cleric. This interpretation of the rules, then, allows for all of the above to co-exist: Christianity, anti-clerics, neutral clerics, secular clerics, the arcane cleric spells of Holmes, the choice made by 7th level LBB clerics and even St. Polycarp’s story of Valens. To boot, all of this has a marvelously Sword & Sorcery feel to it while still giving that (for me) all-important nod to Christianity. 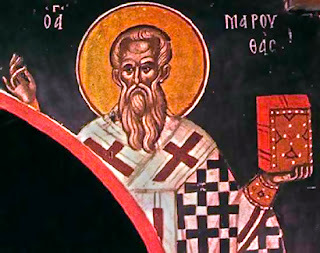 Today is the feast of St. Maruthas, Bishop of Martyropolis (modern day Silvan in southeast Turkey) which sat between the Persian and Byzantine Empires. He is a Confessor because he suffered under the Persian Emperor Sapor, but was instrumental in negotiating peace between the two Empires during the reigns of Theodosius the Younger and the Shah Izdegerd. It was during one of these negotiations that he convinced Izdegerd to provide religious freedom to Christians and he was able to obtain the relics of several Persian martyrs which he relocated to Martyropolis (and the reason the city bore that name). 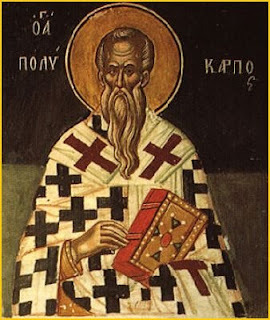 He participated in the Second Ecumenical Council in A.D. 381 and has left behind several writings including: Commentary on the Gospel, Verses of Maruthas, Liturgy of Maruthas and The 73 Canons of the Ecumenical Council at Nicea. Of interest to me is that he wrote in Syriac, which those outside of the world of biblical scholarship might not realize is a really important language. The reason for this is that we have no original text of the OT. Yes, we have Hebrew texts, but those are the ones translated by the Mesorites after the fall of Jerusalem and destruction of the Temple in A.D. 70. I say translated because the original Hebrew text had no vowels and Mesorites added them. Thus, the Hebrew we have is merely one of many textual witnesses to that original text and, when compared to other languages and translations, isn’t even the oldest. While not considered definitive, there are a bunch of textual witnesses written in Syriac. When there is a discrepancy between other translations (Greek and Hebrew being the most authoritative), the Syriac is consulted to see how others understood the passages in question. Beedo of Dreams in the Lich House has recently been meditating about True Names as they can be found in a lot of popular fantasy fiction (notably the excellent Earth Sea Trilogy by Ursula Le Guin). He mentions briefly the power of names in the Scriptural tradition and I’d like to take a moment to expand on that idea in context of the evocative title The Verses of Marutha and the Syriac language. Names are terrifically important in Scripture. As they do in fantasy literature, they hold power, particularly creative power. Note that God allows Adam to co-create with him in Genesis 2 by allowing Adam to name the animals. Note also that this exercise was to try and find a help-mate for Adam — he sought to find power over a particular animal by naming it. This effort continues to this day as we try to scientifically categorize creation and is seen manifested when we name the disease that afflicts us when we are sick. If we know what the disease is, we know how to fight it. Theologically, we do the same with sin. When we confess our sins, we name them and have power over them. Moses sought power over God by asking His name, so God responded with a sentence that begs for a predicate: I AM — we can never have power over God because His name is infinite and cannot be contained by language. Indeed, the number of Scriptural titles and names for Christ are manifold. Moses means “son of” and has the same root as Ramesses (meaning the son of Ra), so his name was shortened in order to get rid of the Egyptian deity part of his name. In the tradition of the Orthodox Church, when a celibate is ordained, they are given a new name. This also happens with the Popes of Rome. There is a language akin to Syriac — an obscure and ancient language, but terrifically important. This import comes from the fact that it is one of the few witnesses left for True Names. The most well known of these texts is the Verses of (insert name of famous scholar here). These verses can only be found in bits and pieces. Thus, when the PCs know they are going up against a truly powerful opponent (like the Lich in Beedo’s example), one of the prefatory quests can be a search for the fantasy analog of the Verses of Marutha wherein is found the creature's True Name. I think these geomorphs are cool (obviously, as I'm making some.) I want to note, however, I don't have a problem with the regular geomorphs. 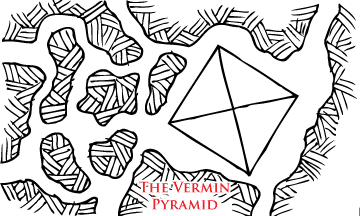 I look at this map I did with the Dungeonmorph Dice fonts, for example. I did some in Word and Photoshop to touch it up, but the end result was evocative and cool. My players enjoyed it. The said file is, indeed, very cool. Like Andrew, I love geomorphs. All one has to do is go over to Dave's Mapper and click on FrDave to see how much effort I have put into the concept, and how cool the outcome can be. 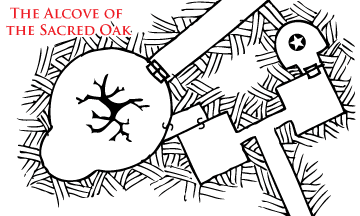 However, as someone who has regularly run game sessions with players who like to wander all over the place and as someone who has attempted to put together a module for general consumption, I sometimes struggle with making those geomorphs make sense. I also say this in context of the whole "the first level of a megadungeon is boring" meme. When I was writing The Slave Pits of Abhoth, I really struggled to come up with a map that spoke to me. I used several methods to try and generate that creative spark and nothing really satisfied. I then happened upon the idea of the 3x5 geomorph and it unlocked all that creative potential that was the initial idea of the Slave Pits. I can't help myself, the creative juices just begin to flow and the dungeons that this process produces are just better than the ones I used to produce using other methods. Therefore, I am trying to share my enthusiasm in hopes that my success will lead to others having success at overcoming the whole "megadungeons are boring" thing. Consider this to be an open thread to let me know about others as they get posted. Thanks to everyone who has participated in this experiment! Freeing oneself of the grid allows the geomorph to mimic the way a dungeon would naturally come to be: a little rough regardless of the skill of those who made it. Gordon says he has more on the way (with named landmarks, no less). I, for one, look forward to seeing them. I also hope that Gordon is not the only one who takes up the challenge. 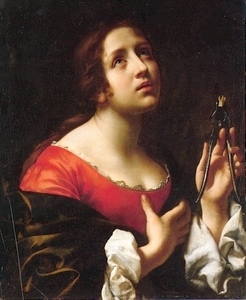 Today is the Feast of the Virginmartyr Apollonia. She was an elderly deaconess of Alexandria whose martyrdom is described in an extant letter of St. Dionysius of Alexandria. According to the letter, the persecution of Emperor Decius (A.D. 249-251) began a full year earlier in Alexandria than the rest of the empire and St. Apollonia was one of its victims. The letter describes a “prophet of evil” who stirs up the masses against the Christians. Mobs backed by the government started to assault the homes of known Christians. St. Apollonia was pulled from her home, beaten about the face until her teeth were knocked out and drug outside the city to a fire the mob had built. They threatened to throw her in should she not worship the idols. She asked for a moment to pray. Understanding that she would be raped before she was killed, she took her chance to preserve her virginity and lept into the flames where she was consumed. Due to the nature of her torture, she is sometimes depicted with a golden tooth around her neck or holding a pincer with a tooth. There are several accounts of virginmartyrs who throw themselves to their own death rather than risk being raped. One might legitimately ask why these women aren’t damned for committing suicide instead of being celebrated as saints. Suicide is the deliberate destruction of God’s gift of life as an act of spite. It is the ultimate act of turning away from God and a denial of God and His Kingdom. In contrast, these women are already dead — their fate is sealed. Rather than taking their life in spite of God, they not only offer themselves up as sacrifice, but also their virginity. Only in these extreme circumstances is such an act deemed acceptable. Due to the fact that this whole episode sounds strange to the modern ear, I suppose this invites a discussion about what is valuable. Traditional D&D places value upon treasure and the death of monsters by equating both with experience points, with treasure being more valuable than the death of a monster. Artifacts from an ancient civilization — this cleaves close enough to traditional D&D to co-exist; however, it emphasizes the post-apocalyptic culture of D&D and is likely to place the assumed culture in some distant future rather than a medieval analog. Freed Slaves — this, intriguingly, does not limit a culture to any sort of time frame. Rather, it assumes a far more politically developed reality. Traditional D&D takes place on the edge of the Wilderness. A campaign which values the freedom of slaves would take place on the edge of a twisted version of Civilization. This type of campaign would also emphasize the problem of extraction as part of the adventure — how do you get what is valuable out of the adventure area? 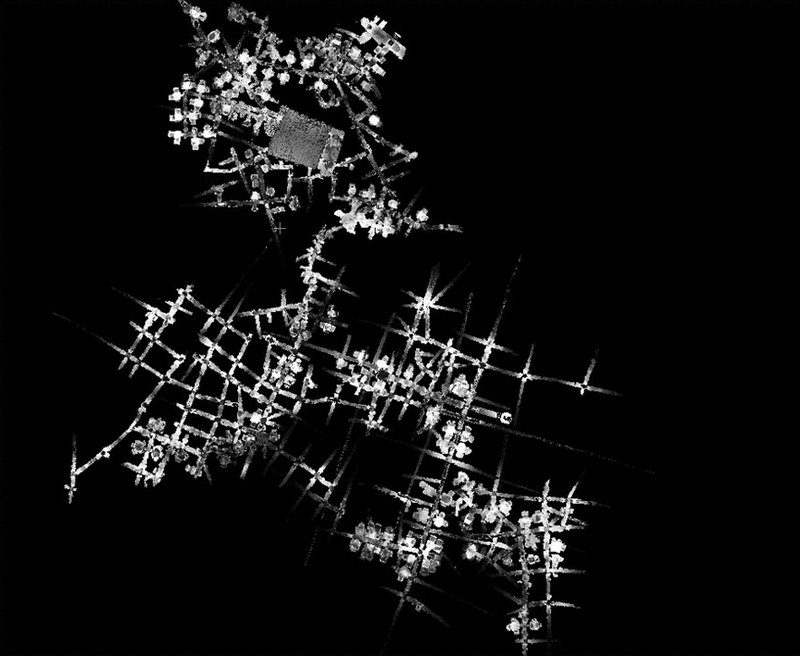 New Species — this assumes a culture that values exploration and a context where it is expected that strange new lands (or planets) are going to have an alien ecosphere. This also emphasizes the problem of extraction — how does one treat/prove the new discovery? I mention these in context of the discussion about the dungeon-as-adventure. I love the Mythic Underground understanding of the dungeon and (as a player) it is my favorite way to play the game; however, I understand that there are many people who actually find that sort of thing boring. Wilderness and city adventures hold much more allure; however, in my experience what is valuable in the dungeon (treasure) makes for a far more morally ambiguous gaming experience outside the dungeon— especially in context of a city. Placing value on things other than treasure could possibly make for a far more interesting campaign in these cases. It would be interesting to experiment with a campaign structure that placed different values on different things according to the level of a character. We see a nascent version of this with the notion that higher level characters get less experience for killing monsters lower than their own HD. What if there where a three-tier system of values where levels 1-3 get experience for different things than levels 4-6 and yet different things than 7+? These rare items appear as human teeth made out of gold. While valuable for the gold from which they are made, they also radiate of magic. Should one wear a tooth on a necklace, the bearer would feel warm and comfortable regardless of the actual temperature and can get restful sleep regardless of the situation. Should one replace their own tooth with the magical tooth, the bearer would also gain the effects of a permanent Resist Fire spell. Do We Still Need Labyrinth Lord? Now that both Moldvay’s Basic Edition and Cook’s Expert Edition are available as .pdfs from WotC, one can legitimately ask the question: Do we still need Labyrinth Lord? LL is an established brand with a license that hobbyists like myself and small publishers can easily and legally publish under with full knowledge that whatever we produce can be used by those who want to do the B/X thing with virtually no conversion at all. More importantly to me, LL has a library of compatible games that are specifically designed to be modular. Original Edition Characters, Advanced Edition Companion, Mutant Future, Realms of Crawling Chaos and Starships and Spacemen 2e are all specifically designed to be able to be integrated together to create all kinds of cool homebrew campaign worlds without having to house rule. In addition, Dan Proctor has provided several free .txt documents for us hobbyists to do exactly that. Despite the fact that I gleefully grabbed up the .pdfs of B/X (and was very pleased to see how well they are bookmarked) I still plan to use LL as my default ruleset precisely because of the versatility it provides me as a hobbyist. There are still many things within the LL library that await to be exploited to go places where B/X on its own can’t go without a lot of work that has already been covered by the LL library. Thus, while I am very happy about what WotC is doing for the hobby and they deserve my gratitude and thanks, Dan Proctor also needs to be thanked because his work has greatly expanded the awesomeness of B/X and taken it to places it never went on its own. There has been a confluence of events and ideas lately that are all peripherally related and I wanted to chew on them all in hopes of putting them all together in a way that will give every one a means of meditating upon the megadungeon/dungeon adventure if not a tool with which to make one. In my line of work, I deal with disease and death on a regular, if not daily, basis. It can be emotionally debilitating and (especially in a culture that does its best to avoid the issue at almost all cost) the grieving process is a long and difficult road. And I am not even talking about what happens to the people I council and help through this process. When it happens to one of your own (as it has with me on more than one occasion) it is devastating. As such I am more than willing to give James as much room as he needs to get through this time of his life. Speculating about if and when the project will be done is not helpful and may very well make the process of grieving that much more difficult. I am a backer of the project. I took a capital risk in order to get a glimpse into a world and campaign that I have been following for years. Even if the rest of the project never sees the light of day, I have gotten my money’s worth with what has been released to backers. It is easily one of the most comprehensive and well crafted megadungeons ever to be shared with this community and I am very much looking forward to playing it one day. The material I have in hand is, frankly, exactly what I was expecting and what I paid for. I consider Dwimmermount, even in its current state, to be a major success. 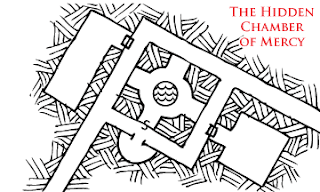 As an experiment with OD&D as written with the basic assumption that it is not wrong, we have all had to seriously wrestle with the concept of the dungeon and the megadungeon. One meme that is making the rounds is that the first levels are “boring.” The most insightful of these meditations is by Roger of Roles, Rules & Rolls. Patience is a virtue everyone desperately needs to reacquaint themselves with. Personally, I have only recently started to read all the material available to Dwimmermount backers, and in context of what is available I do not see the first level boring at all, but (again) I got what I was looking for. However, I do appreciate the conundrum, especially since my own attempts at a megadungeon in my Lost Colonies campaign met with mixed results. I did a review of Matt Finch’s Demonspore. I highly praised its modularity — it was specifically designed to be placed into an extant dungeon and not a complete dungeon in and of itself. This modularity made it possible for it to be utilized as part of my megadungeon and ended up being a highly entertaining episode in my long-running campaign. My challenge to adventure writers and publishers to duplicate this modularity has thus far fell on deaf ears. In my own forays into improving my craft as an adventure designer and maker of megadungeons, I came up with the idea of the 3x5 geomorph. 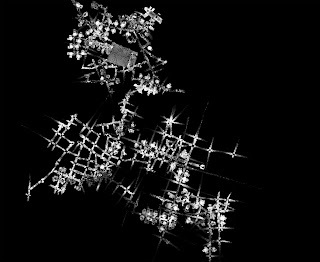 As a concept, it duplicated the modularity found in Demonspore on a smaller scale. Each 3x5 card has more room and flexibility than a normal geomorph and each can contain its own function and backstory. 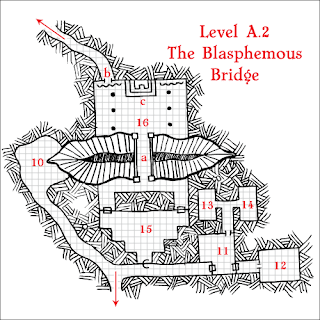 The dungeon maps that I made for The Slave Pits of Abhoth used this method. I challenged folks to start working on 3x5 geomorphs, but that, too, has thus far fallen on deaf ears. I recently purchased another of Matt Finch’s publications, The Tome of Adventure Design. In it, with the use of dozens of tables and a lot of sound advice, Matt lays out a formalized way to utilize the very modularity that I found in his adventure Demonspore and I tried to create with my 3x5 geomorphs. 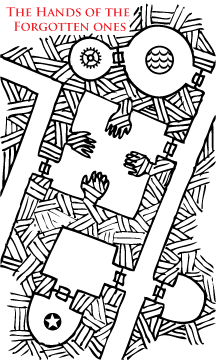 You can roll on a series of tables to determine the characteristics and size of a particular section of a dungeon, including what it looks like, how many rooms, what size those rooms are and how they are arranged. There are also tables for coming up with various kinds of landmarks that differentiate this particular section of dungeon from every other part of a dungeon. In essence, the results of each of these series of die rolls is something that could theoretically fit on a 3x5 geomorph. String a bunch of these together in various patterns and one can come up with several fantastic-looking dungeons that have a suggested history and use because of all the various landmarks that dot each section of the map. Not only is it a gratifying way to build a dungeon, I believe that the end result is much better than some of the more traditional ways of putting together a dungeon. This brings me to my current project, my re-imagined version of The Caves of Chaos from B2: The Keep on the Borderland. I used The Tome of Adventure Design heavily as I constructed my vision of the caves and the result was a series of small dungeon sections which I pieced together to come up with what I feel is and rather exciting 1st level adventure with the potential to become a megadungeon should anyone want to take it that far. No boring here. This map is just brimming with possibilities and could be used in all kinds of different contexts. Indeed, it is specifically designed to do exactly that. Thus, I challenge everyone, instead of whinging about how your latest Kickstarter is behind schedule get out a pack of 3x5’s, draw some maps, label them with evocative landmarks and titles, put them out there for people to use and let us see the fruit of this re-examination of the megadungeon that Dwimmermount has so successfully and beautifully done. I pray this challenge does not fall on deaf ears. 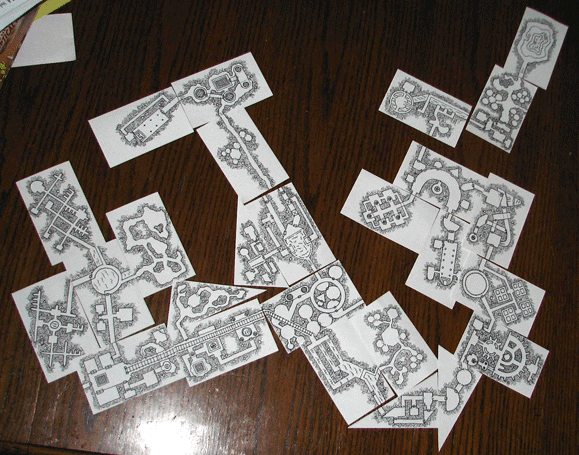 Finally, I need to acknowledge that both James and Matt have made me a better player and a better dungeon designer. I’d like to take the time to thank them both. Today is one of the Great Feasts of the Orthodox Church: The Presentation of Our Lord and Savior in the Temple. This comes from the second chapter of Luke where Christ fulfills the Law (found in Exodus) by being presented forty days after His birth at the Temple as the first born son with a sacrifice of two turtledoves or two pigeons. This story gets really interesting if one looks into the hagiography of Symeon. He was an Alexandrian Jew who was born over three centuries before Christ and was one of the scholars gathered together to do the Spetuagint Greek translation of the OT. When he came to Isaiah 7:14, he did not want to translate the key part of this verse as the virgin shall conceive and bear a Son. 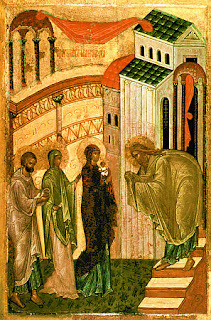 As he was about to write maiden in place of the word virgin an angel stopped his hand and declared that he should not die until he saw this prophecy fulfilled. In other words, when Christ arrives at the Temple forty days after His birth, Symeon has been alive for over three hundred years and when he says, “Lord now let your servant depart in peace” he is asking God to finally allow Him to die. In fantasy, prophecy is one of those tropes that I do not care for. This is in large part due to the fact that it fails to understand the real purpose of prophecy, which is the revelation of God. I also dislike it because it is lazy storytelling that largely removes free will from the equation. Due to the fact that RPGs (especially the way that I prefer to play them) are largely dependent upon player choice, prophecy is not something I have ever seen work well in the context of an RPG. 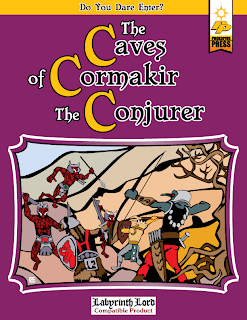 One of two things is likely to happen: the campaign gets railroaded into fulfilling the prophecy (thus begging the question, why is this an RPG game and not short story, novella or novel?) or the character in question does something (like dying) so that the prophecy proves to be false. A far more productive use of prophecy within the context of an RPG is that found in the historical context of the prophets: they were warning the people of God about the consequences of their behavior. If you continue to ignore God (and the fact that you are made to become like Him), bad things are gonna happen. This does two things: 1) it honors the true purpose of prophecy — it reveals the characteristics of God that we can aspire to be like; 2) it honors human freedom — there is no coercion when you tell a child that if you touch a hot burner on the stove, you will be burned. This use, of course, assumes you are interested in including the kind of theology into the hobby that I am. Even so, the aspect of this story that interests me the most is the idea of an NPC who cannot die, but rather than seek ways to exploit it (as the various flavors of undead are want to do), this person is seeking out the circumstances in which they can die. Due to the simple fact that this undeath is not being exploited, such a character is obviously trying to either undo some wrong or seeking out a specific kind of good. This makes for a potentially fascinating interaction with PCs who are normally obsessed with not only not dying, but exploiting the various powers granted them through experience and adventuring. It turns a lot of gaming (and life) assumptions on their ear and challenges everyone to look at the game (and life) from a different perspective. Not to mention the fact that such an NPC would make an absolutely fascinating patron, because once the criteria of what this person needs accomplished is known, a direct interaction with the NPC is not actually necessary. Thus, whenever circumstances come up that might fit the criteria, the PCs are given a choice — do we make a side-trek to help the patron on our own or do we do what we really want to do and continue to potentially doom this person to what he or she perceives as a curse? What happens when those opportunities are ignored? This is the kind of NPC that has the potential to be a catalyst for players making interesting choices that result in great gaming sessions — something the fantasy trope of prophecy never can.